that if you look closely, and know what to look out for, they are different, and some are surprisingly beautiful. At the time, encouraged (not little) by a Plant ID deadline looming, and with the help of two lovely colleagues, I started looking more closely to conifers, and I was able to recognise Cedrus atlantica, I picked a favourite in Pseudotsuga menziesii, with its pinepple scented dark green, flat needles, started to be obsessed by the difference between Thuja and Chamaecyparis which I couldn't quite pin down for a while, and almost wrote a whole blog entry on the intriguing seeds of Cephalotaxus. And I started taking pictures of conifers in woods, still with uncertain identification skills. 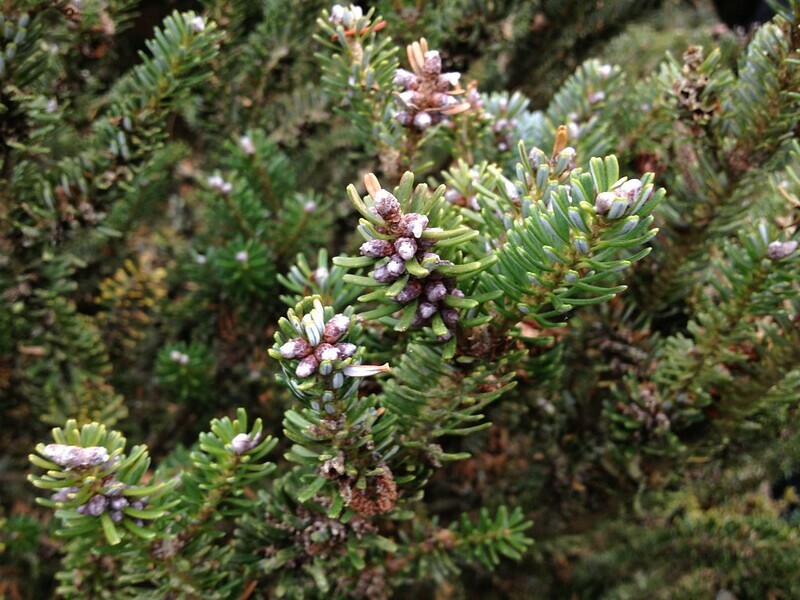 Now I have another opportunity to have a go at identifying conifers, as we are having a dedicated Plant ID. Today we even enjoyed a walk in the pinetum with two conifer experts. Apart from having the opportunity to look at the various specimens and have their habits and garden merits explained, we got a very useful quick guide to tell apart the genus Abies and Picea (the "Christmas trees"). I also found instructions online to tell them apart from pines, genus Pinus. We were told how to identify CEDRUS too (also in the family Pinaceae), which carry their leaves in whorls around the stems, looking like tufts, and similarly to Abies their cones never make it to the ground intact. Cedars come in three main species: C. libani, with level branches, C. deodara, with descending branches, and C. atlantica, with ascending branches. Besides family Pinaceae (to which the three genuses above belong, and which also covers Larix, Pseudolarix, Tsuga and Pseudotsuga) conifers also include family Cupressaceae (with Cupressus, Juniperus, Thuja, Metasequoia, Taxodium, Cryptomeria, Cunninghamia, Cephalotaxus etc), Taxaceae, Podocarpaceae, Araucariaceae and, interestingly, a family I had never heard of Sciadopityaceae, that only contains species Sciadopitys verticillata. Conifers belong to group of plants gymnosperms, meaning naked seed, as they do not develop inside an ovary, but are exposed (i.e. on the scales of pinecones). So, at the end of the walk, what were my favourite conifers? 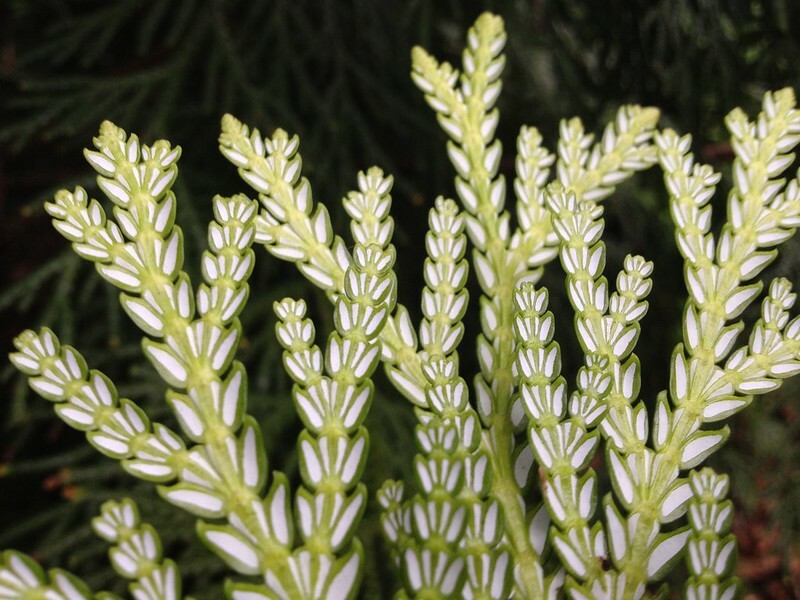 Thujopsis dolabrata, Cupressaceae, for its stunning underleaf, where the stomatal bands form a branching pattern. Abies koreana, Pinaceae, for its squat, square-tipped and stiff needles, without mentioning the blue cones, when they come out!